Last week, Fulton County mailed Solid Waste Service bills to City of Atlanta residents. 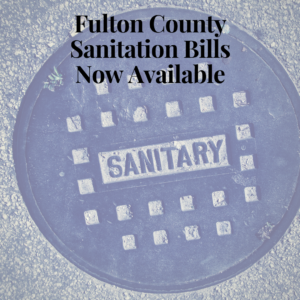 These bills may be found online at https://www.fultoncountytaxes.org/solid-waste and must be paid no later than January 15, 2019. Like tax bills, these bills are mailed to the owner of record as of January 1, 2018. If a property has been sold in 2018, the seller is the likely recipient of this year’s bill and may forward it to the new buyer. It is the buyer’s obligation to seek out the bill(s) and make sure it is paid. At closing, the seller gave the buyer the seller’s share of the bill for this year based upon an estimate. This means that the buyer is responsible for paying the full amount of the bill for this year. Most contracts provide that either party may request from the other additional payment if the estimate varies from the actual bill. As a service to our buyers and sellers, upon request, Campbell & Brannon can assist you with recalculating the pro-ration amounts between the parties. Owners will need to check their escrow statements or with their lenders to see if their particular escrow account is set up to pay sanitary taxes. Not all lenders escrow for solid waste service bills. Please do not assume payment will be made out of an escrow account for this bill. If there is not an escrow account or if the escrow account does not escrow for the bill, the buyer will need to obtain a copy of the bill at the link provided above and pay it in full. Thanks for Campbell & Brannon for this info!